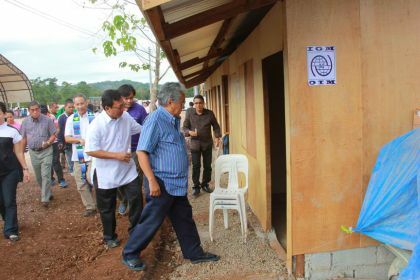 OROQUIETA CITY, Misamis Occidental, Jan. 9 (PIA) –- Gov. Herminia Ramiro has called on all the DRRMC’s of the local government units in the province to alert the people in the mountain slopes and other low-lying areas of possible flashfloods and landslides. The Governor gave the warning after the Philippine Atmospheric, Geophysical and Astronomical Services Administration (PAGASA) issued Weather Advisory No. 3 for the tail end of the cold front and wind convergence issued at 10:00 a.m., today, Jan. 9. PAGASA said both weather systems are affecting Mindanao and the Visayas while the Northeast monsoon or “Amihan” is affecting Luzon. Thus, Mindanao and the Visayas will experience mostly cloudy skies with scattered rain showers and thunderstorms becoming cloudy with widespread rains over Northern and and Eastern Mindanao and Eastern Visayas, which may trigger flashfloods and landslides. Ramiro also asked the local DRRMC’s to warn the fisherfolks to take precautionary measures before going out into the sea, while larger sea vessels are alerted against big waves.